Firstly as a family we survived Living Below The Line for the five days; living on $2.25 each a day. It was a tough week with the hardest moment for me being when I had lunch with Charles Waldegrave from the Family Centre at an upmarket restaurant. I had a glass of water as I watched Charles eat the most delicious looking meal. Poor Charles; I think I might have ruined his scrumptious lunch as he felt guilty for eating while I looked on! I was amazed as I did LBTL of the amount of time I spent thinking about my next meal and how to make the meal work. It reminded me that for much of the world, this is a constant experience of concentrating each day on just feeding one’s family. What I enjoyed about LBTL was the camaraderie between fellow participants, whether it was Bishops, other Clergy or numerous people within our Diocese – the sense of community as we went through a similar experience together was great. Having just finished LBTL, I was delighted at Synod that one of the motions passed was concerned with addressing the growing inequalities within our own bountiful land, where the disparity between the rich and the rest is dramatically increasing. I have spent time reflecting on this motion and the Climate Change motion, particularly wondering what we as a Diocese can do. In some sense it’s easy to pass a motion at Synod on these issues as just about all agree that these are huge areas of concern. The more challenging issue is what we actually do. As God’s people it is important that we are doers and not just talkers. Synod though wasn’t just talking – we also danced! Saturday night of Synod was a real treat as we joined together in a barn dance. We had talked together during the day of the importance in these challenging times of “being family”, however that night we were. We danced, laughed and ate together. It has been Jenny’s and my pleasure to visit different parts of the family this month. To return to Stokes Valley after all these years was a moving experience – we were not prepared for how God is so present in this Parish. The connection with neighbourhood young people and their families was truly miraculous. It was our joy to encourage the Parish to not spend the best of their energy on the challenges they face, but instead to focus on joining in what God’s spirit is already doing amongst them. So often we fight fires in ministry as opposed to following the fire of God in our midst. Finally last weekend we spent Sunday in Pahiatua and Eketahuna, enjoying the hospitality of God’s people. It was my privilege to confirm five young people. The Parish was a beautiful picture of the Kingdom, with intergenerational and multicultural diversity, all sharing in the Kingdom Banquet. I would like to thank all the Clergy and leadership by name, however having seen them all, there would not be room on this page! I think on that note I want to just recognise how blessed we are as a Diocese and say thank you to God once again for the life he has called us all to. We want to be a people of gratitude. The Bishop of Wellington, Dr Tom Brown, has today announced his intention to retire in March next year. Bishop Tom, who is 68, will have completed 14 years as Diocesan Bishop of Wellington when he steps down – and 21 years as an ordained bishop. He was ordained a bishop in 1990, and served seven years as assistant to the then Bishop of Wellington, Archbishop Brian Davis. Bishop Tom was then elected to succeed Archbishop Davis, and he was installed as the 10th Bishop of Wellington in February 1998. He hit the ground running. 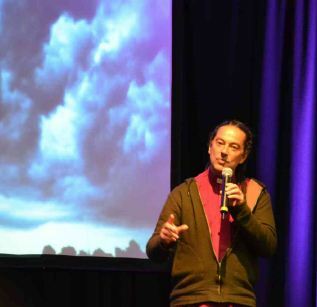 In his charge to his first diocesan synod Bishop Tom declared that change was on its way – and he’d start that by disbanding the diocesan standing committee. When he outlined that move, he says, applause broke out in the cathedral – led by the clergy. “The standing committee had swollen to 27 members,” Bishop Tom recalls, “and it acted like parliament. There was a left wing, a right wing, liberals, conservatives – catholics, evangelicals and charismatics, all fighting for their own patch.” “I had no doubt that it was holding us back from doing the mission of the church,” he says. 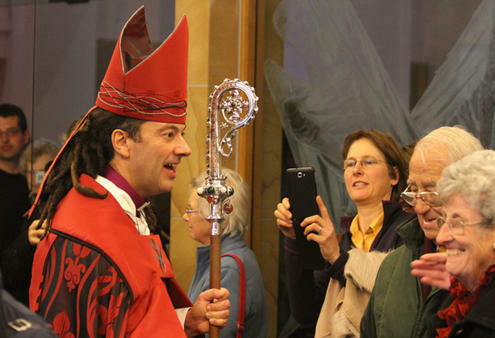 He persuaded the synod to replace that standing committee with smaller, more focused mission, ministry and management groups – whose members are appointed (rather than elected) by an appointments panel. All sorts of deeds have blossomed in that culture. For example, the Diocese of Wellington has been the pivotal force for the development of a Good Shepherd Secondary School in its companion Diocese of Kagera, in Tanzania. That high school, which is now equipped with science labs and a library, was the only one within a 500km radius, and is now providing secondary education for 300 plus students. And the development of that school continues, with Wellington’s support. When the disastrous Queensland floods struck at the end of last year, the Diocese of Wellington sent priests to lend a hand to its companion Diocese of Brisbane – and the Diocese of Wellington took the lead on Anglican fundraising for Christchurch. Two new Anglican church related schools have been established in the diocese during Bishop Tom’s watch, and he’s overseen the rebirth of the Order of St Stephen – an order of mission for young people in the church. On behalf of the Diocese Bishop Tom has also signed a formal covenant with Urban Vision – whose members live with some of Wellington’s most marginalised people, in homes in some of its toughest suburbs, and which has also established the Ngati Awa retreat centre near Waikanae. “Urban Vision approached us,” says Bishop Tom. “They wanted to be accountable to a bigger church. We talked for two years, after which we made promises to each other, and they brought themselves formally under the protection of the Diocese of Wellington. And when Mark Brown, the former head of the New Zealand Bible Society, approached him about getting his covering for Epiphany Island, the cyberspace cathedral he pioneered, Bishop Tom took the risk of backing that venture, too. 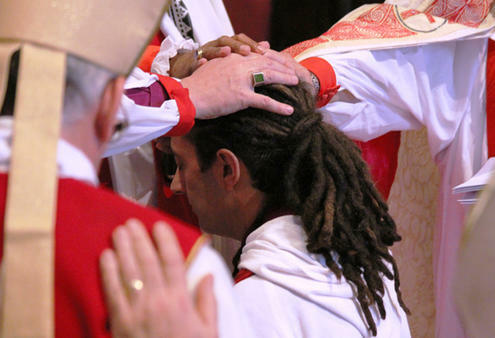 The connection with Mark didn’t stop there, either – because in 2007 Bishop Tom ordained him to the Anglican diaconate, and then 2008 to the priesthood. “When he began as Bishop of Wellington, Tom Brown already knew his own diocese and the wider church here very well. “This equipped him with confidence, I think, and from that base he was able to demonstrate real care for others, and model innovation and clarity for us all. Bishop Tom will continue to live in Wellington after he retires. But he says he’ll be staying well under the radar. With his wife Dwyllis he’ll be focusing on family, friends, their own faith community – and he’ll be pursuing his hobbies of golf and fly fishing.